Hide treats under cake slices in the Dog Twister for the fun to start. To get to the treats, your dog should move, jiggle and push the cake slices. The game provides hours of entertainment for both dog and owner. The Dog Twister provides hours of fun and entertainment for your dog. It consists of cake slice shaped pieces that fit in the board. After hiding treats under the cake slices while your dog is watching, the game can start! The treats can be found by moving, pushing or sliding cake slices with their nose and paws. By pulling on the handles, the slices can be moved around on the game. The difficulty level of the Dog Twister game is level 3. Please look here for more information about the games of Nina Ottosson. 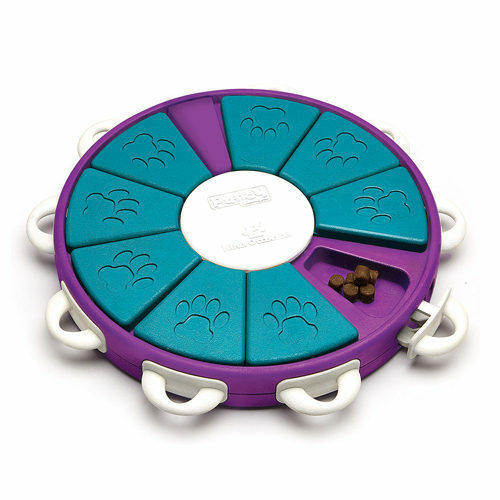 The Dog Twister is made of recycled plastic, which can easily be cleaned with water and soap, and is dishwasher-safe. Make sure there is no soap left in the game before giving it back to your pet. Have you used Nina Ottosson Dog Twister before? Let us know what you think about this product. Good idea and probably could work perfectly well with some dogs. However, my Cairn Terrior, just chewed it to pieces. This is a nice idea for a toy but unfortunately my collie usually paws at it, which lifts up the pockets even when 'locked'. It doesn't actually take that long for them to do once they've got the hang of it but given it a 4 as it's fun for initial training until the novelty wears off. Would probably get a snuffle mat/scatter feed instead. These just end up taking space for not much reward.